Brain Booster Rating: 8 out of 10. Bannas are high in potassium and fiber. The fiber helps you feel full longer while you study. The non-fat yogurt is high in calcium. 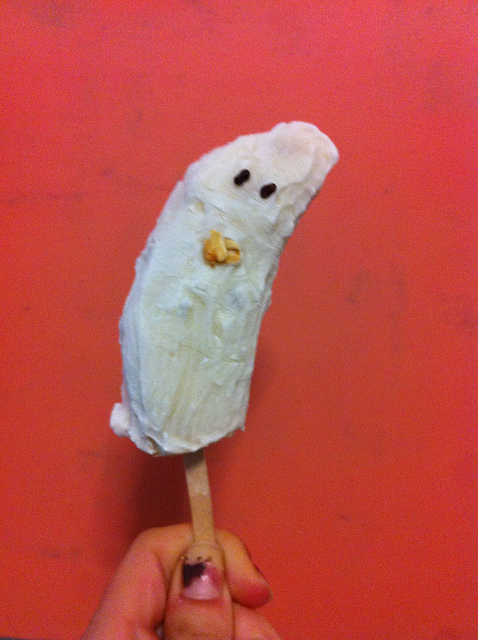 Mildly sweet, these banana ghosts will satisfy your Halloween candy cravings without processed refined sugars, making them a perfect midterm study snack, while still being spooooooky. This is an easy no-cook snack great for using up extra bannas. If you’re feeling more indulgent, substitute melted white chocolate for the yogurt. For the eyes and mouth, you can experiment with different decorations such as rasins or cereal–my grocery store was out of chocolate chips so I used cocoa sprinkles and granola. To make a banana ghost, simply cut a banana in half. Insert the popsicle stick in the bottom of the banana. Coat the banana with yogurt or melted white chocolate using a knife to spread it. Decorate with chocolate chips, and freeze over night.